LEGOLAND Malaysia, the sixth LEGOLAND to be built in the world and the very first in Asia, is scheduled to open on 15th September 2012 (Saturday)! In conjunction with the grand opening, LEGOLAND Malaysia will be invading everywhere through roadshows with pre-opening passes & rates! The ticket can be purchased now at LEGOLAND Malaysia roadshow (refer below). 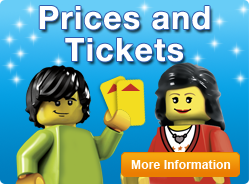 Latest Updates: Don't miss out this LEGOLAND Malaysia Special Ticket Price promotion deal! The LEGOLAND annual pass can be purchased now at LEGOLAND Malaysia roadshow (refer below). Visit travel.1000savings.com introduction on LEGOLAND Malaysia for more information. Do you like LEGOLAND Malaysia promotion? LEGOLAND Malaysia had removed the 1 Utama roadshow from the schedule. This page will keep up with updated latest information on upcoming LEGOLAND Malaysia roadshows, so do bookmark this page to check out ya! At PWTC. WHICH AUTHORITIES AGENT CAN TO KNOW? can we buy the promotion price online? It's not coming to Penang.